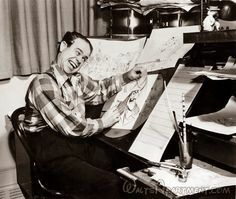 Disney Legend Ward Kimball – AND One of the Nine Old Men! Ward Walrath Kimball (March 4, 1914 – July 8, 2002) was a Disney Legend and one of the world famous Nine Old Men. These cast members were the core animators at Disney who created some of Disney’s most famous works, from Snow White and the Seven Dwarfs onward to The Rescuers. Walt Disney jokingly called this group of animators his “Nine Old Men,” referring to Franklin D. Roosevelt’s dismissive description of the nine justices of the US Supreme Court.